Did we mention it also looks a bit nicer, too? Ordered yourself a shiny Oculus Rift DK2? You might want to check your email - after a frustrating last-minute delay, it looks like the next-gen headset has finally begun shipping. Around 10,000 of the 45,000 ordered Rifts will be initially sent out, so a lot of you will have to make do with this reality for a few weeks longer. But hey, at least the wheels are finally turning, right?. It's an appropriate week for this to happen, with Facebook and Oculus announcing they'd finally sealed the deal. 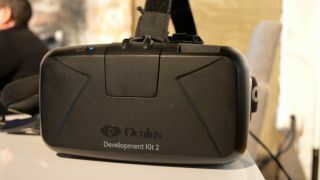 At the time, Imre Jele, co-founder of Bossa Studios (creator of VR title Surgeon Simulator), told TechRadar that Oculus promised him "nothing will change" after the acquisition when it comes to gaming VR. We certainly hope that's the case. With DK2, the Rift has a 1080p, less motion blur and, most importantly, motional head tracking. Patience is most definitely a virtue. Trust us, we've tried it - and it's so, so awesome.